Really the only disappointing thing that happened was the snowstorm that come out of nowhere. Seriously on a Wednesday, that included my favorite titles, we were forced to close. Hopefully you all didn't miss out on some of the great books that were released. Regardless I'm going to cut to the chase and get right to the books I enjoyed the most. Let’s start off with a book most of you probably didn’t pick up. With its pink and orange cover and child protagonist, The Ballad of Sang could easily be mistaken for a young reader’s title. I assure you, it is not. Ed Brisson has brought the over the top fighting action that I talked about in last week’s blog (see Iron Fist #77) to an all new title with a brighter color palette and an even darker world. By page three, Sang is silently slicing up Yakuza goons with a flurry of bloody moves that would make Iron Fist cringe. Why you should read it: The Ballad of Sang is going to be just that… a ballad. A short song of violence and death. I fully anticipate the five issue mini-series to be choke full of glorious fight scenes as Sang tears through the streets of whichever China town they’re in, in search of revenge for his fallen master. Sounds familiar right? Now I doubt the Ballad of Sang will ever make a tournament as illustrious as the 9th Annual Cosmic Madness tournament but it will be a book that I’m excited to read each and every week it comes out. Now onto a book that will absolutely go down as required reading. Sean Murphy’s White Knight is rapidly approaching the end of its run as an eight issue limited series but don’t be surprised if this book spawns a Murphy-verse of Batman related titles. This issue has everything. A classic Sean Murphy car chase, the showdown between Jack Napier and Batman you’ve been waiting for, and the Neo-Joker’s final trump card. It’s all leading up to an ending that I couldn’t begin to predict. Why you should read it: Even if you’re looking for the next trade paperback you want to pick up, you need to keep White Knight in mind. Just two months ago I was writing about the building tension between the city of Gotham and Batman. Well that tension already came to its conclusion and Batman has been throw into Arkham Asylum. Each issue has escalated the plot and I’ve finally accepted the fact that I’m supposed to be rooting for Jack Napier to save Gotham from his own inadvertent creation (just like Batman). Now the final confrontation between Neo-Joker and the Real Joker is coming and as I said before I have no Idea what’s going to happen. Though to be honest, I’m rooting for Joker in a White or Purple Bat costume standing over Gotham as your new protector. Then we can really get this Murphy-verse rolling. If you’ve been in the store recently you know that Gideon Falls is the new book I’ve been most excited for. The combination of Jeff Lemire and Andrea Sorrentino may be my favorite creative team in all of comics and their run on Old Man Logan is some of my favorite reading from all of 2017. Now they are teaming up once again, but this time on their first creator owned title. 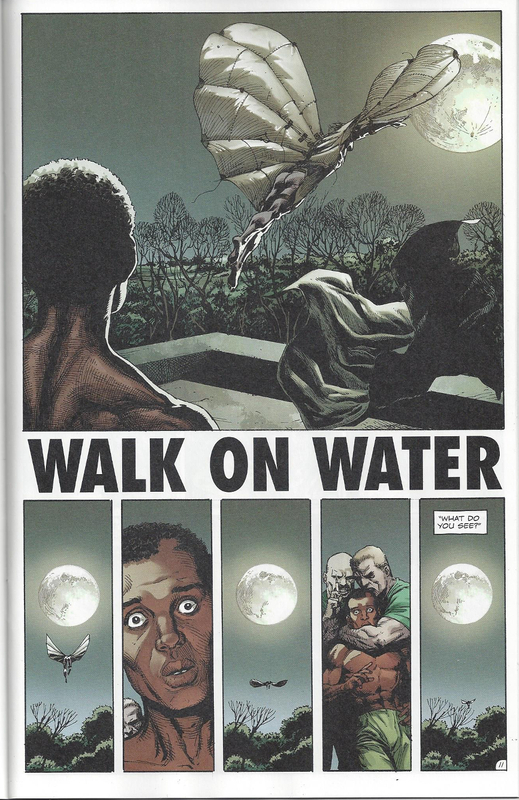 Why you should read it: Somehow Lemire and Sorrentino peaked my interest while our main character walked around picking up trash for 75% of the issue. I think that speaks to Sorrentino’s dark style. He uses some really crazy perspectives, in a way that filmmakers might, so that the reader knows they’re getting into this creepy world without the dialogue outright saying it in the first couple of pages. By the time they start to explain the direction they’re going to take I’ve already been sold and the centerfold is just the icing on the cake. 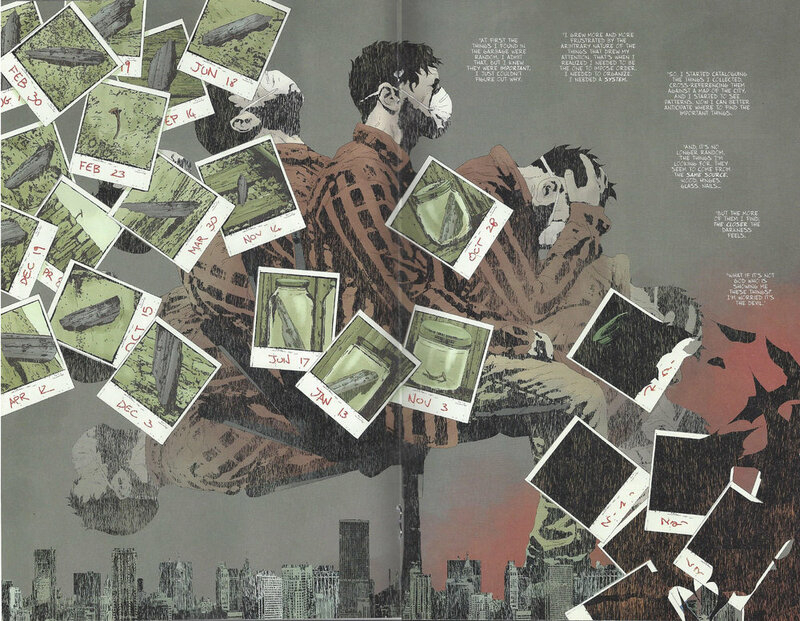 I understand this book may not be for everyone but if you’re looking for that new psychologically creepy book, kind of like Jonathan Hickman’s Black Monday Murders, then Gideon Falls is the book you’re looking for. I would also be willing to bet the book comes out on a more regular schedule than BMM too because this team has proven they will make their deadlines in the past. What Marvel has essentially done is cancel the Guardians of the Galaxy book and re-label it Infinity Countdown. While the Prime book took you around the Galaxy to see where each of the Infinity stones were, Infinity Countdown #1 only focused on the Guardians. Two epic space battles at once that center on the now gigantic power stone and an army of angry Groots. Saving the best book of the week for last. Following the end of his second most famous book, Invincible, Robert Kirkman could have made his next book about a small town guy who’s life was about to be turned upside and then turned that another new TV show. Instead he comes out with this gem. Inter-dimensional travel with 10 foot tall gooey looking monsters. 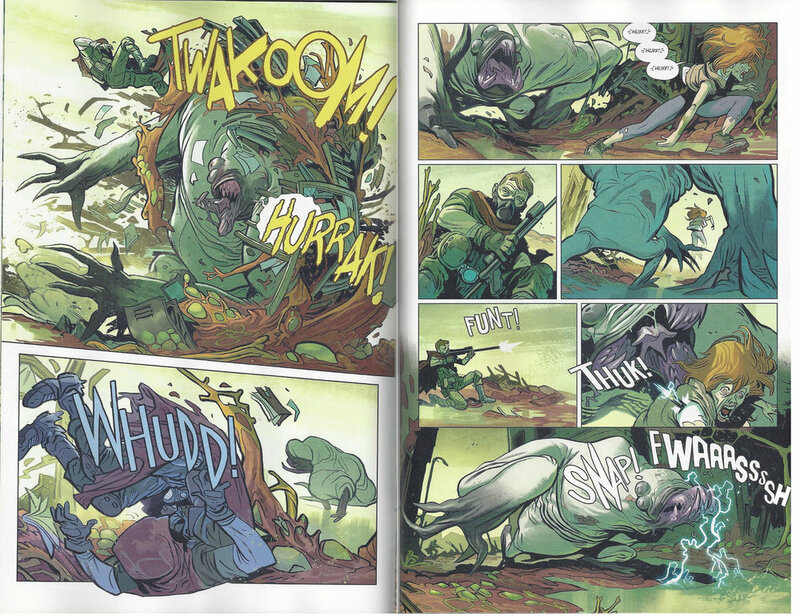 The best part is that Kirkman went out of his way to find an unknown artist (Lorenzo De Felici) because his style fit the big gooey monsters that Kirkman wanted to do all along. 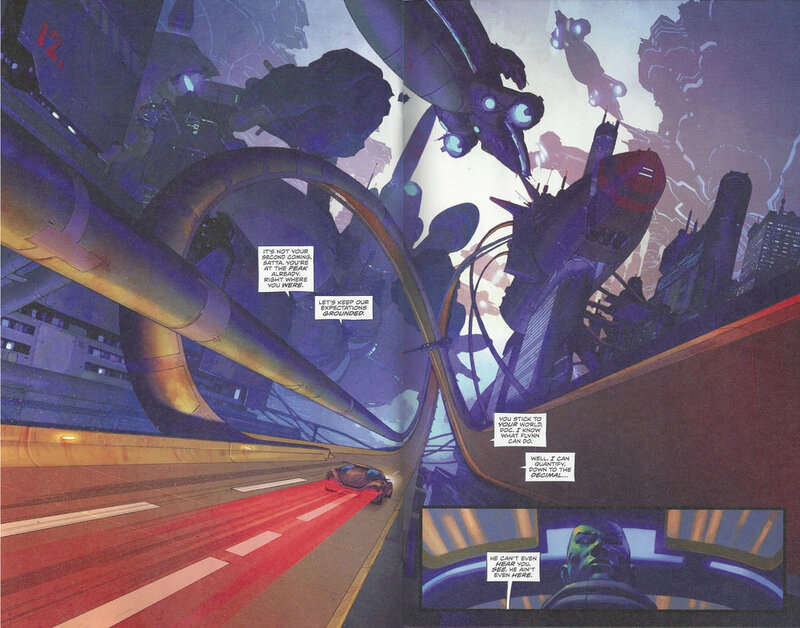 Why you should read it: The book oozes plot lines and future world building. Where did these monsters come from? What created the event? Where is Nathan’s brother? How is the regular world coping? Who are the people who live in the underworld? How will the returned cope? Why can’t this man get some funding? What about the “Song”? When will Robert Kirkman introduce a mysterious third group? All these questions and more that will be fleshed out and explored in an ever growing and easy to digest monthly comic. Welcome to the next decade of your comic life. The Hulk is officially back! Avengers #684 brought back one of Marvel’s best characters (just like Legacy has been promising) and also served as a recap for his absence. He quickly came and made short work of the back-up Avengers and reminded everyone why he is one of the 10 best superheroes ever. Even better, the Hulk came back a savage and much smarter than his last re-incarnation. Hopefully that stays, along with his glowing green eyes, for when he gets his own book again in a few months. Why you should read it: We’ll get to the interior in a second but first we have to talk about that cover. In what I felt was somewhat of a light week, Avengers #684 stood alone on the new comic shelf, and it seriously made me consider adding a best cover of the month blub at the bottom of the page. It’s freaking epic and I’d be lying if I said I didn’t already have a poster of it at home. However if you’re not reading Avengers No Surrender or could care less about the Hulk then you probably don’t need to read it. It was really good and it added a whole bunch of answers to the story but No Surrender is just about over and it won’t be easy catching up. On a side note for all you Marvel big wigs reading this. The weekly book inside the Avengers title is WAAAAY better than a bunch of tie-ins within an event book. Hopefully you do it again soon. Why you should read it: Remember when I said the words “bloodbath” and “Yakusa Goons”? To be honest I don’t remember what happened in issue #31 but when the Yakusa bust through the door on page four (wasn’t a good page for them), I sat up because I could see what was about to go down. “The sword makes a strange sound though his skull. Like paper being torn. Reminds me of a Frank Miller comic. You only get one page (this one is 15) for this book because of the rampant f-bombs though out. Unfortunately there was no way for me to avoid excessive blood shed so for that, I’m sorry. I’m going to try something different for this week because Marvel won the month before DC could put out Metal #6 and Doomsday Clock #4. The Avengers trailer dropped on Wednesday and it was so good that I almost wish I hadn’t seen it. I’m convinced Thanos is about to pull a Revenge of the Sith. This week’s books only sold me on that idea more. Marvel is really good about differing power levels. Think back on the first Avengers movie. Thor > Iron Man. Hulk > Thor. The books are very similar. It’s not like Batman is just running around the Marvel Universe beating up everyone because he’s armed with the Boy Scout’s motto. This week I lucked into a perfect reading order. I always start with the book I think I’m going to enjoy the most. Why save the best for last when I can save the best for as soon as I get comfortable? Thanos #17. Mighty Thor #705. Avengers #685. Doctor Strange Damnation #3. Thanos #17 again. I talked about all of these books other than Damnation already so I’ll skip telling you that Donny Cates is on fire and how great Russell Dauterman is for the time being. The fight that Thanos has been building to is here. The not-so Silver Surfer has become worthy enough to wield Mjonir. He is now the last remaining being alive to face TWO Thanos’ and a Punisher/Ghost Rider/Herald of Galactus. From page one it’s a fight. New Onix Surfer crushes the Cosmic Ghost Rider to prove to you that he has ascended well beyond a herald of Galactus. He then catches the Hulk (real Hulk that Thanos’ has in a pit of misery) by the throat and beats him too. Then just when you’re starting to think “Maybe this super cool Onix Surfer can do it.” Thanos One and Thanos Two come out of the shadows and pummel that fool. Thanos Wins. Time being over. Donny is on fire. He made a mashup of a bunch of awesome characters and made me believe that someone, somewhere could beat the mad Titan. The book’s story line is literally called Thanos wins. Then after my mind is sufficiently blown I pick up Mighty Thor #705 and DARE it to be better. Again the battle that has been building for months comes to its climax. Jane Foster leads with an uppercut followed by a Dothraki crowning ritual with a lightning storm to the Mangog’s face. Mangog aint no slouch though. He comes back strong so Thor throws him into the sun. 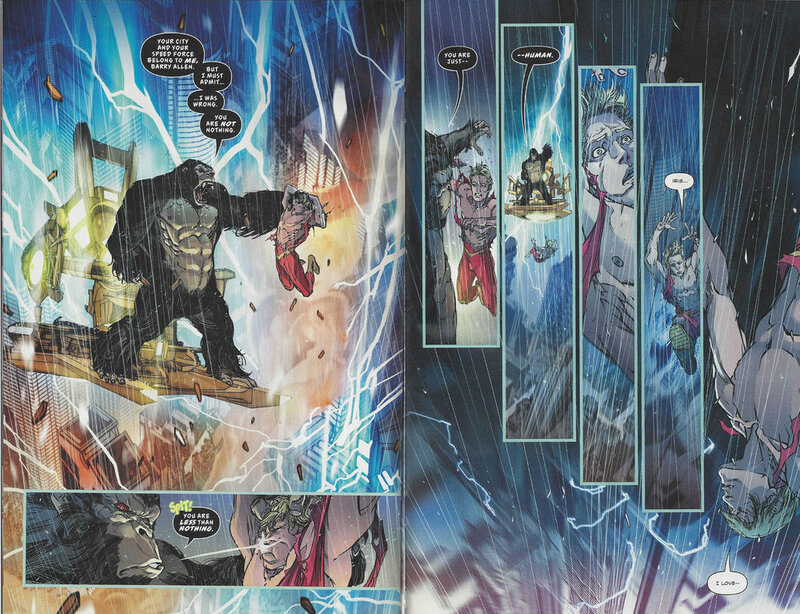 The Mangog comes back almost immediately again and now he’s on fire, pummeling gods. This goes on for almost the entirety of the issue before Jane Foster finally wins. After such an incredible fight, Thor just couldn’t end there. No, Jane Foster pulls Odinson over and has to make-out with him while Asgard flies into the sun and she dies too. I can’t think of a better way to go and I’m a guy. Just like “Thanos Wins” Thor’s title is “The Death of the Mighty Thor” and even though you know their endings, they lived up to everything they promised and more. This is where the reading order comes into play. Avengers #685 is nothing but a showcase of what Hulk can do. The Avengers throw everything they can at him and he proves once again why he is Incredible. In Doctor Strange Damnation #3 you see an army of Ghost Rider infected heroes, one of which is Doctor Strange himself. Now I don’t know what’s stronger; Doctor Ghost Rider or Cosmic Ghost Rider but I’m willing to call it a tie. See what I’m getting at? The Silver Surfer with Thor’s hammer could take down both the Hulk and a Cosmic Ghost Rider without any problem. And yet Thanos Wins. Remember Marvel is notoriously good at keeping their power levels consistent. Don’t be surprised when Avengers Infinity War ends and the only words that reverberate in your head are… Thanos. Wins. Both Doomsday Clock #4 and Metal #6 came out this week after a month off and anyone who’s read them knows it was worth the wait. Doomsday Clock is just starting to heat up. Metal came to its dramatic conclusion. To be honest the books aren’t similar at all. Heck, Doomsday Clock #4 has a stack of pancakes on the cover while Metal #6 has an armored up Batman riding a Joker dragon into battle. To read them back to back was a treat though and it’s easy to enjoy them for different reasons. Doomsday is a mystery. Each panel could contain clues to Dr. Manhattan’s whereabouts while it looks like Saturn Girl is back? Or maybe she is Dr. Manhattan? Issue #4 mainly focused on the new Rorschach’s backstory. His life after the event in the Watchmen universe and how he lost his mind. It draws a pretty cool comparison between his current state in Arkham Asylum and his perseverance from his previous insane asylum. In fact the whole book is centered around these comparisons, using the Rorschach test to show his character growth while also teasing to make sure I was paying attention to everything I was looking at. Or maybe they were going for a “these masks we wear” type of thing. Probably both. 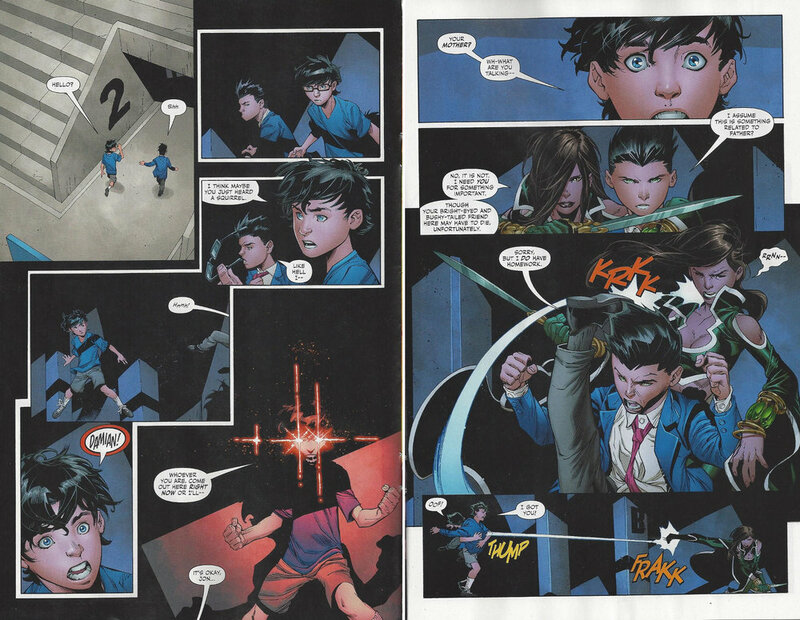 With the nine page panels and the whole mystery thing going on, each page contains a ton of information. Metal #6 is completely different. I read Metal after I read Doomsday and I was ready to soak up every word and find all the clues. Then I got to “…the Earth has sunken under the Cosmic Membrane” and remembered what I was reading. Metal’s point is to see how long they can get you to suspend your disbelief. Don’t worry about the giant Darkness Monster. Accept that Hawkman has turned into giant Hawk beast. You should be able to outright guess that Batman is going to fly out of the dark portal in shiny X-Metal armor, punch a Joker Dragon in the face, and then ride him into battle! The best part is Scott Snyder is just toying with you. He even throws in a Batman and Joker vs The Batman Who Laughs fight at the end and Joker says “what’s the one thing Batman never imagined? Fighting alongside… ME!” Good thing he was prepared for the Joker Dragons, otherwise his whole plan would’ve been shot. Now I know you’re concerned that Metal is over and you’ll need a new book to fill its void. It’s a good thing I too came prepared. Remember DC had the THREE best books of the week. The Terrifics #2 was that book. It took a little while for me to decide which of the New Age of Heroes book I liked best but shockingly I like Jeff Lemire’s Terrifics (Sideways is pretty good too though). I love the team with Mr. Terrific, Shadow Lass, Plastic Man, and Metamorpho. I really like that they are doing the kind of exploring that the FF used to do. But what makes it stand out is that they are willing to go big with this one. Just like Metal and Doomsday Clock, I have no idea where they are going to go with it because they aren’t afraid to try some new stuff. We’ll see what kind of craziness they can come up with for the new Dark Multiverse but they should only be limited by what they can think of. Well there you have it. March summed up in 3000 words or less. As always feel free to come by and visit me in the store if you want to critique my picks!